You want to travel the world and made the decision to just dive in and go! You’re planning on travelling for an extensive period of time; maybe 3 months, a year or an indefinite amount of time. Great! But how to start your trip? Will you buy a one way ticket or a round the world ticket? Why not start your big trip slow? Here are my 5 reasons to start your big trip slow for first time travellers. In 2007 I have travelled over land from Russia to Nepal. My main goal was Nepal and Tibet, but instead of an airplane ticket to Kathmandu, I decided to go overland. I wanted to start my big trip slow and I took the Trans Mongolian Railway to Beijing. If you wish to know more about this journey by train, read my elaborate guide on the Trans-Mongolian Railway. Don’t say I haven’t warned you: it’s elaborate! The route of the Trans-Mongolian Railway with our stops along the way. I really enjoyed this way of travel as the start of my trip and therefor I give you my 5 reasons to start your big trip slow. 5 Reasons to start your big trip slow for first time travellers. Planning for your big trip can be super stressful. You need to save the money, move out of your house and fit everything into your backpack and say goodbye to all your friends. You have been reading and preparing for months for your big trip and finally the day has come. When you hop on a plane and dive right into the life on the road, your stress levels will be sky high, especially the first couple of days. Our home on the road for 5 days and nights. 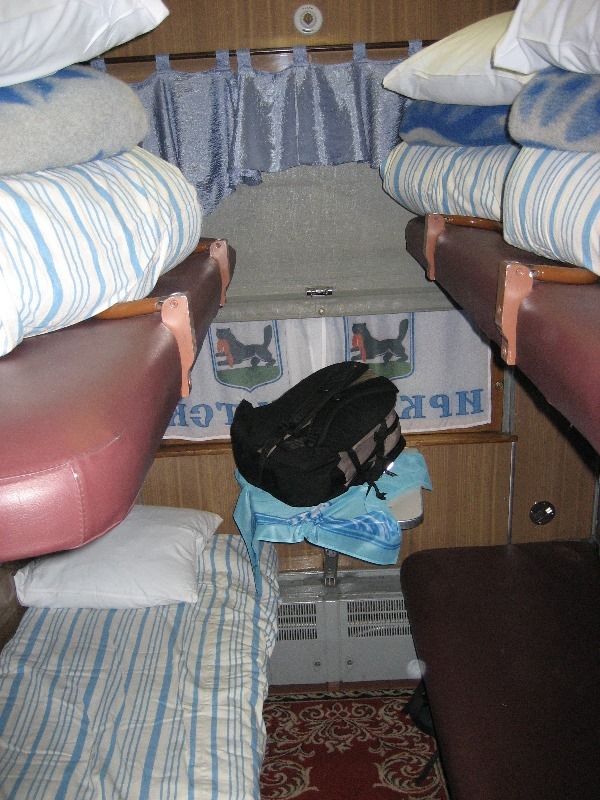 When settling into our train compartment on the Trans-Mongolian Railway, we knew we would be there for the next 5 days and nights. We didn’t need to unpack, because there was no room to leave our luggage and we didn’t have to check into any hotels. We didn’t have to hassle with any taxi drivers or be scared about getting lost in our new city. All we had to do was sit back and relax. De-stress. And believe me, there is nothing as de-stressing as sitting on a train for 5 days and having nothing else to do then look outside the window and watch the Siberian landscape pass you by. We chatted a bit with our neighbours, got a cup of tea, flipped through some magazines and took a nap, or two. To unwind from all the travel planning, is one of my main reasons to start your big trip slow, that’s why it is #1! When travelling, you have to arrange a lot of things. Where to stay, what to eat and how to get there. You have to watch your money and learn to haggle with street vendors or touts. You’re getting bombarded with a lot of impressions of the strange culture you’re travelling though. This can be overwhelming in the beginning. When you take it slow at the beginning of your trip, you can ease into the travel life style easier. Set up camp at your first destination and stay put for a few days, until you’re well rested from the jetlag and are eager to move on. When travelling via train to the other side of the continent, we didn’t have to think about anything. We were on the road and we did see a lot of things, but we could slowly get used to the travel life. Taking the Mongolian Railway across the continent might be something you do not have time for on a regular holiday. Now that you’ve decided to take your big trip, you have more time at your disposal. I have a long bucket list, but there is simply no time to take the Trans Mongolian Express on an average holiday. I was very happy to start my big trip with this “once in a life time” journey by train. Not all destinations are well connected by airplane. Flying into Ulaanbaatar, the capital of Mongolia is a bit of a stretch. So is going by train, but we were passing by anyways. We also stopped in Irkutsk at the Lake Baikal. Normally, I wouldn’t have figured to go there and wouldn’t advice it as a standalone destination. But it’s the greatest freshwater lake in the world and a great stop. Stopping in Mongolia for a week has been such a great experience. We were able to get off the train for a week and toured across the southern part of the country, stretching into the Gobi desert. We slept with a nomad family on the way. Mongolia is a great destination and I would advise everyone to put it on your bucket list, but it’s not easy to get there. When you’re travelling on the Trans-Mongolian Railway, it’s easy to stop at Ulaanbaatar and stay as long as you won’t. There’s always another train to hop on again. 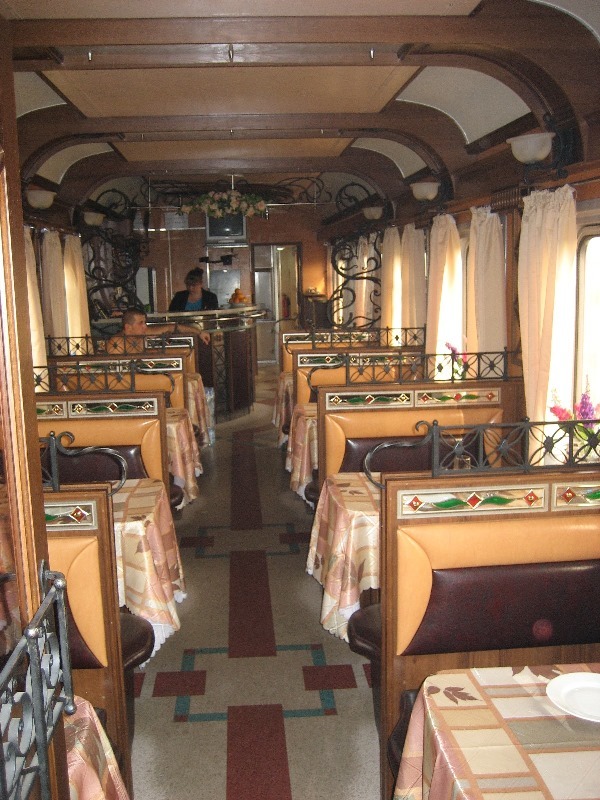 The dining carriage, a great place to meet new friends and all travellers alike. When sitting on the train for several days on end with other people going into the same direction, you have plenty of time to chat. We met many people on the train, who we later bumbed into in Mongolia or Beijing. You really get to know people and it’s a great way for making travel buddies. When you’re travelling with a larger group, travelling slow is also a great way to bond. You will not go out for different activities at night, but you can really bond as a group, which will make you stronger for the journey to come. So these are my 5 reasons to start your big trip slow. A great way of travelling to Asia is by going by train with the Trans-Mongolian Railway. It gives you the opportunity to de-stress from your travel preparations and you can ease into the travel lifestyle slowly. It will be a once in a lifetime experience, because you will not be able to do it on your short regular holiday and you get the opportunity to stop at more remote places. It’s also a great way to make friends for the rest of your big trip. Have you travelled by train with the Trans-Mongolian Railway? What do you do to take things slow at the beginning of your trip? What to do in One Day in St. Petersburg Russia? This train journey seems amazing! it is one of my dreams to take the trans siberian train – not sure when, as we are now hitchhiking across the continent, but one day for sure! As for slow travel, all i can say is i was never the one to rush through places. Maybe you can hitchhike the route one day Karin! That would be awesome.